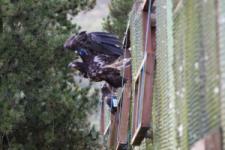 After 5-8 weeks in captivity all 22 White-tailed Sea Eagle chicks collected in Norway this year are being released into the wild in Killarney National Park. The first to go were 9 birds released on 4 August, a further 10 birds on 11 August and the final three birds will be on 19 August. The different release times largely reflected different rates of development, the most advanced bird being released first, and also the need to release birds in more logistically manageable batches. Birds released later also benefit by following earlier released birds to food dumps. Almost all release birds had good first flights, most taking the usual route towards the shore of Lough Leane. A good north-westerly breeze aided flight on 4 August. Several birds had already found the food dumps by 6 August, much sooner than birds released in previous years. As is the case in all years of the release a few birds were slow to leave. A female in the very first cage to be opened moved quickly onto the release hatch but then spent the next few hours surveying her environment before taking to the air (see photo). Her old cage-mate even flew out past her but yet she refused to budge. Happily she is now doing well in the wild. Another hit the ground rather than negotiate the skies but eventually worked out what to do with those 2.4 metre wings! First flights for eaglets in captivity, like newly fledged chicks in the wild, are always a bit of a lottery, 10 out of 10 for effort but landing is often heart in the mouth stuff! So far only one eagle has ended up in the lake on the day of release. Luckily eagles are good rowers! Before release, as in past years, all the birds were wing-tagged and had transmitters attached so they could be tracked in the wild. This years tag colour is sky blue (left wing) with white (right wing) being the site colour. A letter, number or symbol on the tag identifies the individual bird. Vhf backpack transmitters were fitted to 19 birds. These can be tracked in real time but have the disadvantage that a signal can only be picked up when the bird is located line of sight to the tracker. Mountains block the signal although a high vantage point (even better a plane!) can allow a signal to be picked up 100km away! Three birds were fitted with solar powered GPS transmitters: female tag b (lwr case) from Hitra, male tag S from Hitra, and male tag 3dot from Leka. All were released on 4 August but remain in the Killarney area. Very soon you will be able to follow their movements online so watch this space! Many thanks go to the following hardy souls that gave up their weekend to tag eagles: Damian Clarke and Anne Fitzpatrick from Wicklow, Daniel O?Lachlan from Milltown via Belfast, John Lusby (Birdwatch Ireland) from Banagher, Marc Ruddock and Emma Meredith from Northern Ireland. We must have been the only people in Kerry completely oblivious of the scores at the Irish Open golf in Killarney though we could see the crowds from our perch. Only the eagles would have been sharp eyed enough to read the scoreboard! PS: Male Star has been on a voyage of discovery in Northern Ireland since leaving Lough Gara (Roscommon/Sligo) in mid-July. More of him anon. Female Fiadhna continues to hang out in Donegal. You can check out their movements on the website.